We are huge fans of children's books at my house. I have wonderful memories of reading books each night with my mom. Now that I have a family of my own, our walls are lined with bookshelves. My son loves to read, and that is something I am so grateful for! The story is an adaptation of an old folk tale, which tells the real story behind the mysterious lights that appear in the swamps and marshes of Virginia and North Carolina. You may have heard of these as swamp or marsh gas, but you should know the truth! It's Wicked Jack and his burning coal. 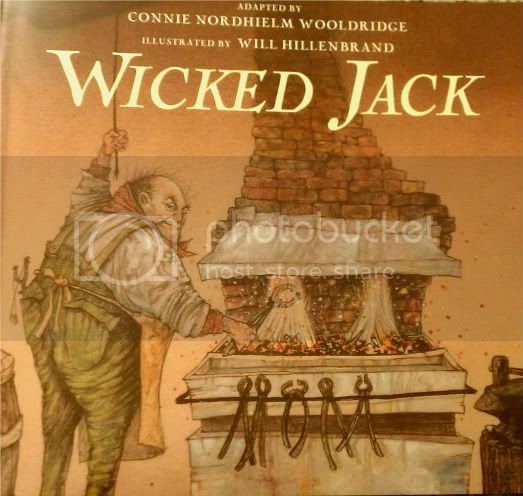 Readers will be delighted by Wicked Jack's antics as he plays tricks on unsuspecting guests. These tricks eventually get him turned out of both Heaven and Hell! The descriptions of his meanness are funny and entertaining and are accompanied by clever and interesting illustrations. You don't have to worry about the book or the illustrations being too scary. They are all in good taste and always have a touch of silliness to them. Also be sure to visit Children's/YA author Connie Nordhielm Wooldridge at her website, www.conniewooldridge.com. You can also follow Connie on Twitter, Facebook, and Linked In. Thanks for entering at Why We Love Green! Easy Eco-Challenge #1: Unplug it!